Tanner Pearson, once the wheels got rolling, had a fine 2015-16 season. He scored three times in overtime – including a postseason dagger – and totaled 16 goals and 24 points over his final 33 regular season and playoff games months after some earlier periodic inertia led to a few healthy scratches. But with 79 games played, it was Pearson’s first full regular season in the NHL, and those slips in detail may be somewhat symptomatic of a younger player who was experiencing the ebbs and flows of his longest season to date. That’s not going to fly this year. Pearson is among the players who will be counted on to supply offense while accentuating the consistency that has largely been there through the first 146 games of his NHL career. Tenure-wise, the 24-year-old with a hard, accurate shot and the ability to shoot off the rush is no longer in his infancy in the league and will quickly be entering the prime years of what should be a lengthy and productive NHL career. The idea that there’s less leeway for Pearson wasn’t lost on Darryl Sutter, who acknowledged that his winger’s productivity will factor into the degree of success experienced by the team, which this year won’t be able to rely on the services of first-line stalwart Milan Lucic. And therein lies the catch-22. 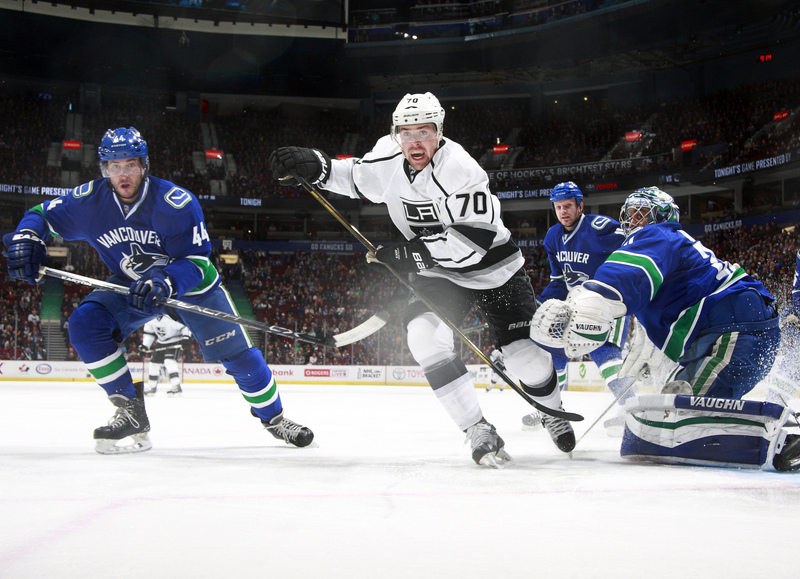 The Kings need Pearson to be highly productive, but should a significant rise in scoring materialize, they will struggle to find the capital to re-sign him. Pearson, like Tyler Toffoli, is due to become a restricted free agent after the season and should command a sizable pay raise. Both players signed two-year deals after the 2014-15 season; Toffoli’s for two years at $3.25-million per season, Pearson’s at $1.4-million per. Both cap hits represent “bridge” contracts that are more likely to double in average annual values than remain closer to their current cap hits. The Kings have already allotted $58.6-million to 15 players for next season, according to financials provided by General Fanager. This season’s salary cap is $73-million. In other words, should Los Angeles intend to keep both Pearson and Toffoli, there’s going to have to be some excess trimmed from some area of the roster. 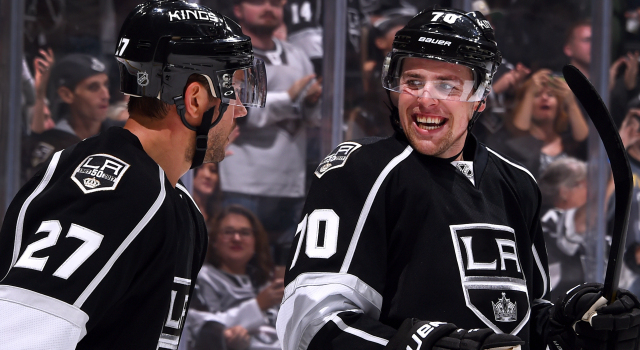 When Pearson played with Carter last season, the Kings scored 1.49 GF/60 and yielded 2.60 GA/60 at even strength. Both players experienced better raw Corsi percentages away from each other than alongside each other. That’s likely to improve as the consistency and detail continues to solidify in Pearson’s game; Pearson, the club’s first round draft pick in 2012, is too good of a player not to find success over the long run alongside other skilled players in Carter and Toffoli. While they’re tied together, the personal productivity isn’t as important as team-wide success, and the entire team is looking to rebound from a disappointing conclusion to a 102-point season. It gets to become a grind. Obviously my first year was when we won. You go home, you get two months to kind of hit the reset button, which is a pretty quick turnaround. The last two summers haven’t been the same. You’re able to go home, and you have a good chunk of time off, and then on top of that you’ve got a really good chunk of working out to do and getting back into shape. I think last year we had that emphasis of coming back in great shape, and we still came up a little short of where we wanted to be. I think just be more consistent. Last year I had that hump where I was healthied a couple games and whatnot, and looking at video of where my game should be – when it’s good, and when I’m bad, what it’s like. I just think I need to get rid of those dips and just be more of a consistent player.